← Should You Carry a Backup Gun? All right, let’s have a little fun. We have all heard phrases that are used in personal defense that have been used too long and too often. Some were funny the first few times we heard them and others just never quite made sense. Here are a few of my favorites. I often think that what this person really means is that he hopes his fancy gun will make up for the fact that he hasn’t gotten the training that he needs, nor the regular practice that he should get. Okay, I’ll admit that I chuckled at this the first few hundred times that I saw it. But the anti-gun crowd is convinced that we are all sub-human Bubbas. I’m not sure it’s a good idea to try to prove them right. That’s okay, I never did well in math either. The first time I heard this I checked and, yes, I was zipped up. Then I thought, “But, I’m not carrying my six; I carry an auto.” Actually, I never got around to watching my six; I was always too busy watching my back. Speaking of gunwriters, I’m sure that we use, and overuse, some phrases and terms that wear you folks out. So, why not share them with us? It will give us a chuckle and maybe, just maybe, help us improve our writing. And, while you are at it, share those terms and phrases that make you shake your head and drive you nuts. Let’s have some fun. 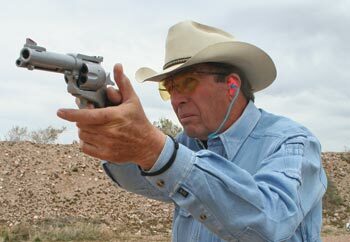 This entry was posted in Adventures, Philosophy, Revolvers, Semi-Auto and tagged shooting illustrated. Bookmark the permalink. Venerable anything, usually a 1911. “Iconic” – I read or hear it several times each day. “It’s the Indian not the arrow.” – The first 20 times were enough; it’s true, but it’s now cliché. “Active shooter” – Is there any other kind? “Situational Awareness” – Isn’t it enough just to be aware? I get it, most people understand it to mean 360 degree, ground-to-sky, and really super duper aware rather than just simply awake. But it has rapidly replaced “FYI” – in the military it’s now FYSA for everything. “Old smoke pole” – rifle is fine.
. . . and this is no exception. This phrase is found many places, but since I read a ton of firearms related articles, this is getting on my nerves. I just need to get over it! _ “cut my teeth” / ” shoots better than awh can” / ” ol thumb buster”…I know there’s a few more. Try to ignore them or give up ready reading? How about “if I do my part”? “Watch your six” is a fighter pilot’s admonition to keep one’s eyes moving and prevent a rear attack from a bandit. It’s more than just bravado.